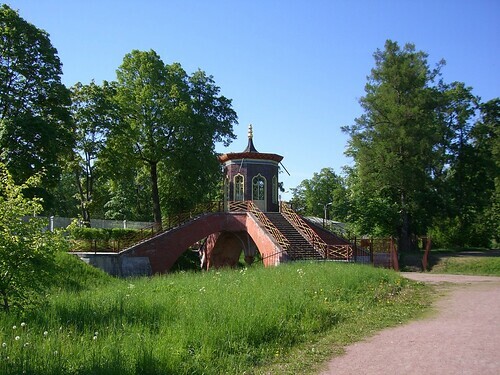 This cute little 4-way bridge in Alexander Park, Tsarskoye Selo (Tsar's Village), now part of Pushkin, St. Petersburg, Russia is known as Cross Bridge (Russian: Крестовый мост - Krestovy most). 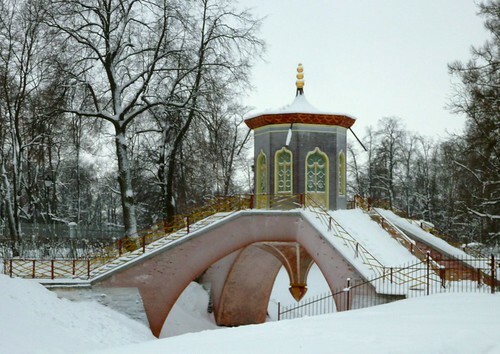 The bridge which from top look like a cross, was built in 1779 on the orders of Empress Catherine II, who wanted to build at Tsarskoye Selo, "... a Chinese summer-house on arches with four risers." The Bridge spans a T-junction of the Krestovy Canal and although it is small in size, it has magnificent look and shape. A beautiful pavilion over the water, supported by four strong curving arched bridges, each having 23 steps of granite. The keystone, at the junction of the bridges, is in the shape of large pendant hanging over the water. The key stone also provides base for the beautiful octagonal shaped pavilion with four ogee arched doors and four ogee arched windows. The roof is typical “Chinese” roof painted with fish scales pattern, in tune with nearby "Chinese village". View location in Google Earth / Google Maps. (Current GE imagery doesn't clearly show this bridge. However it's 4-paths can be clearly seen in historical imagery of May 6, 2012. Credits: I am very thankful to my friend Kre Nek who sent me its picture and location for inclusion in my tri-bridge collection. Initially both of us were under the impression that it is a 3-way bridge, however on further research I realised that it is a 4-way bridge. Thank you Kre Nek for finding this rare gem of a bridge. Special Note: In addition to this 4-way bridge there is is reportedly another 4-way bridge in Dugger, Indiana, USA (see in Google Maps). It is probably a very low level bridge and presently I am discounting it. Any one interested in it can read discussions about it in Google Earth Community and in Google+ threads.